The Web Marketing Association will also recognize the interactive agency winning the most awards in the MobileWebAward competition with the “Top Interactive Agency” Award. Aperto Move GmbHof Berlin, Germany was named 2013 Top Interactive Agency for the second MobileWebAwards competition in a row. They received 9 awards, including: Best Investor Relations Mobile Application, Best Catalog Mobile Website, Best Directory or Search Engine Mobile Application, Best Environmental Mobile Application, Best Toy & Hobby Mobile Application, Best Events Mobile Website, Best Game Site Mobile Application, Best Government Mobile and Best TV Mobile Website. Each organization that wins 5 or more MobileWebAwards will be awarded an Outstanding Mobile Interactive Developer trophy. Risdall Marketing Groupwas named an Outstanding Mobile Interactive Developer for receiving eight MobileWebAwards in last year’s program. The MobileWebAward’s Best of Industry statue is reminiscent of a personal digital device, it could be yesterday’s smart phone, today’s tablet, or tomorrow’s device. It is crafted of fine jet black crystal with the iconic “W” accent in 24kt plated gold and personalized with your award information. The award is entirely hand crafted by, Society Awards, the makers and designers of other notable award programs such as the Golden Globes, Emmys, MTV VMAs, and CLIOs to name a few,and presented in its own custom gift box. 2014 MobileWebAwards and have one of these fine trophies sitting on your desk. Each year the MobileWebAward competition’s highest honor, the “Best of Show,” will be given to the one best mobile website and one best mobile app that the judges believe represents the pinnacle of outstanding achievement in Web development. In 2013, Hugeand Newsweek won Best of Show Mobile Website for The Redesigned Newsweek.com, which also was recognized as Best News Mobile Website. UBM Design Central and ARM won Best of Show Mobile Application for Signum, which also was awarded Best Electronics Mobile Application. Is your company’s mobile offering up for “Best of Show this year? The only way to know is to enter at the MobileWebAward website! 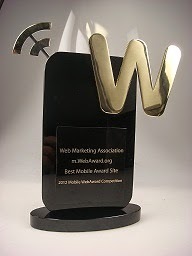 What is the best way to win a MobileWebAward from the Web Marketing Association? To enter of course! However there are ways to improve your chances when the judging starts. During August and September, tips and hints will be posted to the Web Marketing Association’s Facebook Page to help you position your entry in the best possible light. So here are the first 5 tips to get a step ahead of the competition. MobileWebAward Tip #1 – Enter your responsive website. Many organizations are moving away from dedicated mobile site in favor of a responsive overall website. These sites are welcome in the MobileWebAwards and will demonstrate to senior management and clients the foresight in developing a responsive site. MobileWebAward Tip #2 – Pay Attention to the Audience and Mission Statement. The judges use the audience and mission statement to get a sense of what you are trying to accomplish. It puts things into perspective for them. If you are too vague or worst too long winded, the judges will go on what that think the goal of the site should be and it may not be what you expect. You don’t have to include results, just who you are targeting and why. MobileWebAward Tip #4 – Tell Your Other Offices. One of the most prestigious awards given out each year is the Top Agency award, given to the agency which wins the most awards in a given year. If your agency has multiple offices or international offices, make sure they submit their entries also. We will combine all offices of the same company to count for that award. MobileWebAward Tip #5 – Select the Most Appropriate categories. The best way to pick the category your site will compete in is by saying to yourself “What would be best for my marketing program if I win?” Many categories overlap because over the years people complained that they were one and not the other. The other thing to consider is how competitive the category might be. The “Mutual Fund” category is narrower than the “Financial Services” category and might be easier to take the top prize. However, Best Financial Services Website might have more cache for your marketing efforts. Sometimes the best idea is to enter both categories and double your chances to win. The Web Marketing Association’s MobileWebAwards competition is currently accepting entries and is looking for qualified judges to help adjudicate this year’s award program. This award program recognizes the individual and team achievements of Web professionals all over the world who create and maintain the best mobile Websites and the best mobile applications. The Competition deadline for entry is September 30, 2014. Judging for the MobileWebAwards will take place in Mid-October, 2014, and winners will be notified by e-mail one week prior to the general announcement of winners in December, 2014. Judges will consist of a select group of Internet advertising professionals with an in-depth understanding of the current state-of-the-art in mobile website design and mobile application development. Past competition judges have included top executives from leading corporations, institutions and media organizations such as Ogilvy Interactive, R/GA , Saatchi & Saatchi, Blattner Brunner, Sun Microsystems, National Cable & Telecom Association, Refinery, Euro RSCG, A&E Television Networks , New York Post Interactive, The Cincinnati Enquirer, Ernst & Young , J. Walter Thompson, Xerox, Art Institute of Pittsburgh, and Aristotle. The Web Marketing Association is an organization working to create a high standard of excellence for Web site development and marketing on the Internet. Staffed by volunteers, it is made up of Internet marketing, advertising, PR and design professionals who share an interest in improving the quality of online advertising, Internet marketing and promotion used to attract visitors to Web sites. The Web Marketing Association’s two annual award programs, the WebAward Competitionand the Internet Advertising Competition Awards, have been helping interactive professionals promote themselves, their companies, and their best work to the outside world since 1997. At ClickZ Live San Francisco you’ll learn to engage customers and increase ROI by distributing your online marketing efforts across paid, owned & earned media. Join the leaders of today’s digital marketing & advertising industry. The Web Marketing Association is pleased to announce the call for entries for its 2014 international MobileWebAward competition. It recognizes the individual and team achievements of Web professionals all over the world who create and maintain outstanding mobile Websites and mobile applications. 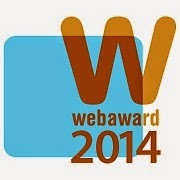 The deadline for entry in the 2014 MobileWebAwards is September 30, 2014. The entry form for this award program can be found at www.mobile-webaward.org. · A “Best of Industry” MobileWebAward will be given in each of the 96 industry categories, including financial services, medical, small business, travel, advertising, transportation and government. · The competition’s highest honor, the 2014 MobileWebAward “Best of Show,” will be given to the one best mobile website and one best mobile app that the judges believe represents the pinnacle of outstanding achievement in Web development. · The Web Marketing Association will also recognize the interactive agency winning the most awards in the competition with the “Top Interactive Agency” WebAward. · Each organization that wins 5 or more MobileWebAwards will be awarded an Outstanding Mobile Interactive Developer trophy. Huge and Newsweek won Best of Show Mobile Website for The Redesigned Newsweek.com, which also was recognized as Best News Mobile Website. UBM Design Centraland ARM won Best of Show Mobile Application for Signum, which also was awarded Best Electronics Mobile Application. Judging for the 2014 MobileWebAwards will take place in October and winners are expected to be announced in late December. Judges will consist of a select group of Internet professionals who have direct experience designing and managing mobile Websites,–including members of the media, interactive creative directors, site designers, content providers and webmasters – with an in-depth understanding of the current state-of-the-art in Web site development and technology. Past WebAward judges have included top executives from leading organizations such as A&E Television Networks, Agency.com, BGT Partners, Worldwide, The Cincinnati Enquirer, Comedy Central, Disney, Euro RSCG, Ion Global, J. Walter Thompson, John Deere Company, New York Post Interactive, Organic, Inc., Refinery, R/GA, Saatchi & Saatchi, SAP, Starwood Hotels, Sun Microsystems, Warner Bros. Online, Xerox and Website Magazine. The 2014 MobileWebAwards are sponsored by the following leading organizations: Website Magazine, Burst Media, Small Army Creative Services, EContent Magazine, ad:tech conferences, CLickzLive, and Webmaster Radio. The Web Marketing Association thanks these companies for their commitment to the entire online marketing community.